Every few months, as I see fit, I get a trim. I revisited Robin Sjoblom after loving what she did to my curls back in April. This time around, we went with a technique slightly different from last time, called the Foundation Cut. Here is Robin's take on the cutting and styling process she used on my hair, step by step. 1. Stop using butters and oils at least 2 weeks before your appointment (no Shea Butter/Shea moisture/coconut oil, as these things coat the hair and cause heavy build-up). 2. 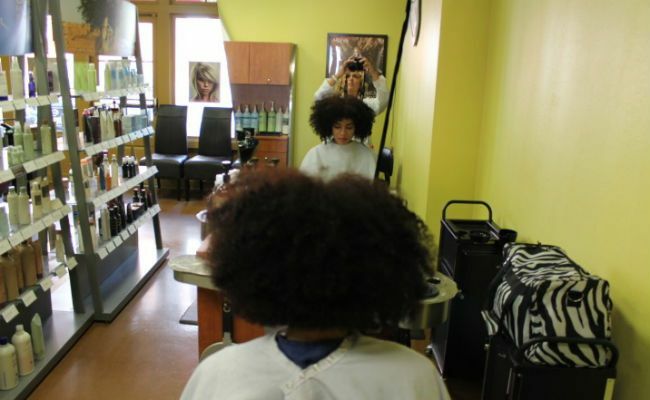 Get off of the usage of silicones and sulfates, if possible. 3. Detangle well before coming in for your appointment. 4. Arrive with hair down, freshly cleansed & dry, no braids/pony tails, clips, etc... like you are going on a date (you can use light product to show definition. 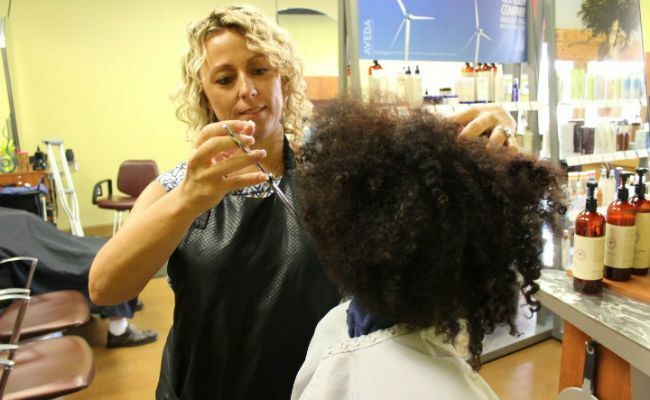 Stylists need to see as much of your natural curl definition as possible. 5. Bring products you are currently using so that we can review products with you. We want to educate you on what to look for and what to avoid. We cut your hair first, then do the cleanse, hydration, and style. This is why we ask all these things of you upon your arrival. Bring in the products you are currently using so we can review ingredients with them and show what to look for and what to avoid. You may also choose to donate any unwanted products to our local women's shelter, 7 Bridges! This cut starts at $150 and includes a cut, cleanse, hydration, style, product bootcamp (lesson), and before and after photos. I went with the Foundation Cut for Devri, I like this cut the best for my Type 3c and 4 naturals. On Devri, I created a solid foundation for the cut from the bottom up. It's still a dry cut like the Deva method, but my cut creates super lightness and volume. The hair literally doesn't touch as it moves up the shape of the head (as you can tell), creating a personalized shape that is unique and made just for you. *Editor's Note: At this appointment I learned that there is more than one type of DevaCut, and the Foundation Cut is one of them. I'll be sharing more information on the different options in an upcoming article. Co-wash & detangle: I used A half-dollar size amount of Innersense Color Radiance to co-wash and detangle and leave in with warm water. Styling: I raked a quarter size amount of Quiet Calm on top at the root then smoothed to "kill the frizz". I also added a quarter or half-dollar size amount of IHold Gel over the top to seal in the moisture in a glaze motion over the top and around the head. I told Devri to flip her head over so we could make sure the back was covered, then I parted her hair where she wanted the curls to fall, and clipped at root. Dry and shake out! Moisture is what most people are missing. So many curly girls assume gel is the answer to defining curls! Often times you need a good conditioner, and what I call a "filler" (a moisturizer). Hair gets frizzy because it is reaching out into the atmosphere for moisture! If the hair if "filled" with moisture and then coated with gel to seal it in, your curls will not get frizzy. The curlier you are, the more moisture and the less gel you need, because you are already curly. Moisturizing will keep the curls juicer. The less curly you are, the more definition you need. 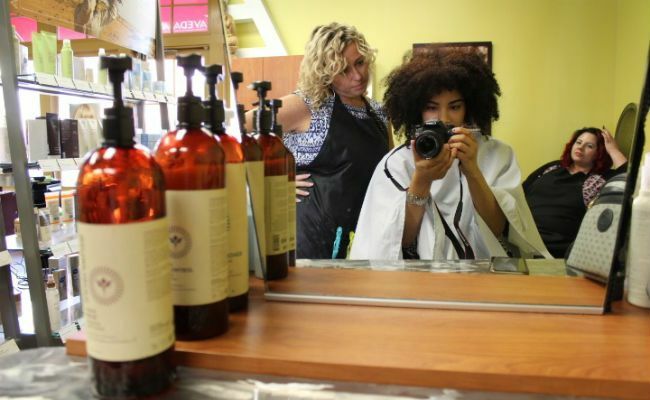 Use products that are curly girl friendly--no silicones or sulfates. Silicones are plastic and repel moisture. Again, curly hair needs moisture. The best conditioners can't get through a silicone to moisturize so be aware of what you are using. You need to remove any silicone with an apple cider vinegar treatment of a vitamin C treatment. Sulfates (Sodium Lauryl Sulphate) are detergents. While it is the cheapest way to cleanse, it is also the most drying. These are found in laundry detergent, toilet bowl cleaner, and tooth paste--and in a lot of shampoos. Curls need moisture, not detergent. Get trims every 3-6 months. Do your research on who to see in your area. Don't just go to your first 'Deva Stylist." 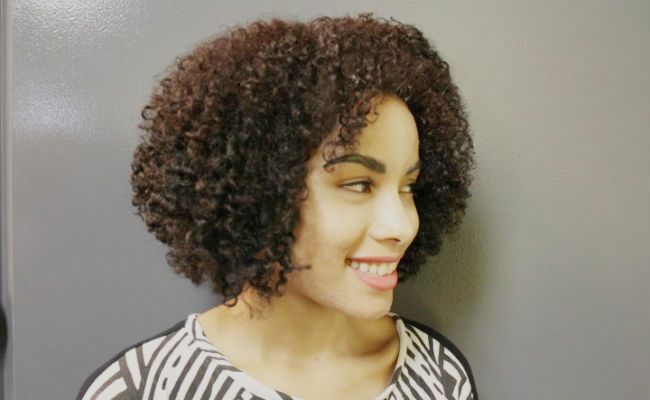 Check the reviews in the naturallycurly.com database and devacurl.com, ask your potential stylist for before and after photos, and check social media (Instagram photos, Facebook page, Twitter, Pinterest). Check curlyhairartistry.com for names of curly stylists as well. Remember, you may have to wait weeks to see a good stylist. Ask a fellow curly girl (a friend, coworker, or even someone you follow online) if you love how it looks, bring in photos of what you want, and what you do NOT want. 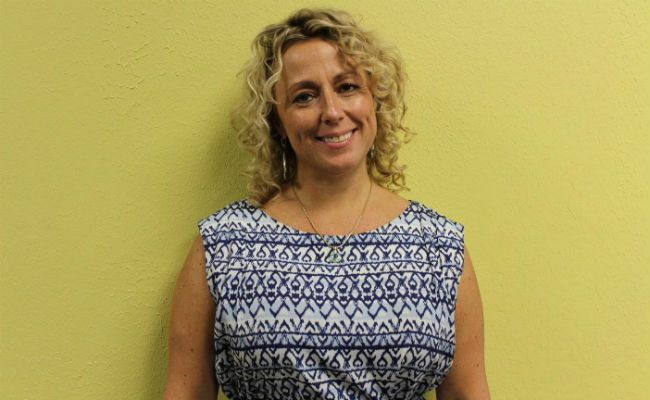 Robin Sjoblom is a curly hair specialist at Southern Curl (inside Fuzion Hair Studio) in Smyrna, GA. If you would like to book an appointment with her call 770-490-6485 or email [email protected] You can read more of her salon reviews here.